On 8 December 2016, the Waste Management Association of Australia (WMAA) awarded the 2016 WMAA Women in the Environment Award to Samantha Cross, Director Cross Connections Consulting. The award began as an initiative of the WMAA Victoria Branch, and recognises the achievements of women in the environment industry. 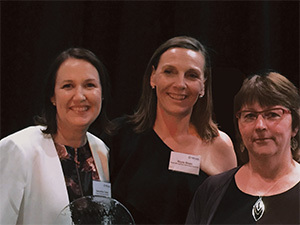 In 2015, the award - sponsored by Blue Environment - was opened nationally to all eligible women in the environment sector who have made a significant contribution to environmental sustainability in Australia in the past five years. This year, nominations came from almost every state of Australia, many of which reflected significant experience in the waste industry. "While it is always hard as a judge to have to pick a winner, it's also heartening to see the breadth and depth of women's efforts for environmental improvement", said Christine Wardle from Blue Environment. Samantha Cross is a leader in the circular economy space across industry sectors. She presents waste generators, business and government with alternatives to landfill, facilitating opportunities to achieve enhanced sustainability and commercial outcomes. Whilst working at Transpacific Cleanaway, Ms Cross implemented a strategy resulting in Unilever Australia achieving Zero Non-hazardous Waste to Landfill, an Australian first at its Tatura site. Unilever has received a Green Globe Award and APC award for the achievement. She has developed logistics models to address barriers to landfill diversion, recently facilitating the establishment of five aggregation points for plasterboard waste (100% recyclable) going to landfill due to inefficiencies in collection and transport. "I believe we as an industry, and as individuals, have a role to play in encouraging, supporting and fostering greater diversity. We want to attract a mix of people to make sure our industry continues to draw, develop and retain talent, challenges the status quo and supports the changing needs of our businesses and communities when it comes to better managing waste", said Ms Cross. As an appointed NSW EPA Circulate Program facilitator and preferred consultant to the OEH Sustainability Advantage Program, Ms Cross has been involved in projects across numerous industry sectors. One such project is the Plastic Police® Partnership program, which has been developing an innovative recycling and education program engaging local communities to divert soft plastic packaging from landfill. Once accredited as a social enterprise, the program's expansion into communities across Australia can follow. "Collaboration is equally important in ensuring greater resource recovery opportunities are realised in the circular economy as are product stewardship initiatives that deliver effective and sustainable outcomes", continued Ms Cross. "I would like to thank WMAA and Blue Environment for supporting and recognising all the amazing women who are part of our exciting industry. My appreciation is also extended to all those inspiring and supportive individuals, both male and female, who have been part of my journey to date and who continue to make a positive difference in our industry." Ms Cross is also the Chair of WMAA's Hunter Regional Group in NSW and is a member of the Hunter Charitable Working Group. The Waste Management Association of Australia (WMAA) would like to announce Gayle Sloan as the new WMAA Chief Executive Officer. Gayle has outstanding senior management skills developed over 15 years working at senior levels in government and industry. 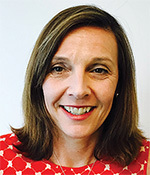 Roles in policy development and government relations at Visy Recycling, combined with almost 10 years as a Director in NSW Local Councils in areas such as Community and Environmental Services, have given Gayle strong insights into the waste and resource recovery industry, as well as working with government to achieve change from a broad range of perspectives. In addition to Gayle's exceptional policy and waste industry credentials, she brings with her an educational background in law; strong communication and strategic planning skills; event management experience; and demonstrable experience in identifying stakeholders and working collaboratively to achieve results. It is a credit to the waste and resource recovery sector that WMAA has been able to attract such a high-calibre senior manager to the role. In accepting this role Gayle stated that she "was very excited to have the opportunity to work with members across such a diverse and important industry". Gayle will begin work at WMAA on 7 November, 2016. Today's decision by the Western Australian Government to introduce a Container Deposit Scheme (CDS) is one more step toward the national harmonisation of the waste and resource recovery industry. Martin Tolar, Chief Executive Officer of Waste Management Association of Australia (WMAA) welcomed the latest piece in the CDS jigsaw "WMAA applauds any attempt to remove state based jurisdictional differences in the regulation of the waste and resource recovery industry. "I encourage the Western Australian Government to work with its New South Wales, Queensland and South Australian counterparts to align the state schemes to a single framework. "This announcement continues the work towards a truly national approach to a Container Deposit Scheme and is a timely reminder to other jurisdictions who are yet to consider a CDS. "Our industry is central to the management of waste and recycling in Western Australia. The Waste Management Association of Australia looks forward to working with the Western Australia Minister for the Environment Albert Jacob and the Department of Environment Regulation to ensure that the best outcome is achieved for the waste and resource recovery industry in Western Australia." The decision made by the Queensland Government on 22 July 2016 to introduce a Container Deposit Scheme, is seen as one more step toward a national approach to litter and resource recovery. Martin Tolar, Chief Executive Officer of Waste Management Association of Australia (WMAA), welcomed the discussion between the governments of Queensland and New South Wales on establishing a single scheme administrator for the two states. "The proposal for a seamless system, through one scheme administrator, can deliver a more effective outcome than two separate state bodies. This is the start of a truly national approach to a Container Deposit Scheme and sends a clear message to other jurisdictions who are yet to consider a CDS. "WMAA applauds any attempt to remove state based jurisdictional differences in the regulation of the waste and resource recovery industry. "Our industry is central to the management of waste and recycling in Queensland. WMAA will continue its discussions with the Queensland Minister and the Department of Environment and Heritage Protection to ensure that the best outcome is achieved for the waste and resource recovery industry in Queensland." The waste and resource recovery industry makes at least a $14.2bn contribution to the Australian economy, and is integral to the lives of all Australians, underpinning economic growth and employment. Effective waste management and resource recovery is linked to our quality of life, and plays a significant role in environmental and public health, planning and infrastructure, resource and energy production, and emergency management. In this election period, WMAA calls on the major parties to commit to the development of the waste and resource recovery industry, to ensure continued growth and contribution to the economy, the high standard of life we enjoy, and as a driver of jobs in the future as we transition away from an economy centered on the mining industry. On 16 May 2016, the Waste Management Association of Australia (WMAA) held its Annual General Meeting in Melbourne. During the meeting, WMAA President Ms Miranda Ransome announced to the WMAA members in attendance the appointment of new directors to the WMAA Board of Directors. Mr Tony Kortegast was returned as the Vice President. Tony is the Managing Director of International Operations for Tonkin+Taylor. He has more than 40 years' experience in geotechnical, solid waste and heavy civil engineering. During that time his work covered a range of project inputs from concept development to public and consent processes, and detailed design and construction management. Mr Adam Faulkner is the successful candidate elected by WMAA members to fill the final directly elected board position. Adam is the General Manager of the Eastern Waste Management Authority (SA). After 10 years managing waste and energy recovery services in one of Australia's fastest growing population corridors in NSW, Adam left his Director role at Tweed Shire Council to head up Hyder Consulting's Melbourne Waste and Resource Management Unit. At Hyder he delivered strategic and operational solutions for some of the country's most prominent public and private clients. Under WMAA's new Peak Membership category, Mr Mark Venhoek, the Chief Executive Officer of SUEZ and Mr Luke Agati, the Managing Director and Chief Executive Officer of REMONDIS were also appointed to the board. Mark Venhoek has been CEO of Australia at SUEZ environnement Company SA since 6 October 2015. Mr Venhoek has significant global experience across the SUEZ group. Previously, Mark was Vice President of SUEZ environnement's waste operations in China where he led SUEZ's waste management operations across Hong Kong, Macau, Taiwan, mainland China and South-East Asia. He has also held positions across Europe including Germany, the Netherlands and Northern Europe. Mr Luke Agati is the Managing Director and CEO for REMONDIS Australia. In his role, Luke introduced the nationalisation and expansion of REMONDIS services and operations and expanded the business to Queensland, South Australia and Western Australia. Luke is the driving force behind REMONDIS Australia, leading the organisation with his strategic vision and passion for obtaining results. Luke is committed to making REMONDIS Australia's premier waste management and resource recovery organisation with an unparalleled customer focus. Ms Ransome said "It's with great pleasure that I welcome these three new directors onto the board of WMAA. These appointments represent WMAA's strategy of re-engaging with the industry's leadership while also striking a balance with democratically member elected board representation. Tony's reappointment as Vice President also ensures WMAA has strong and stable leadership which is essential as we execute our new three year strategy for the organisation and the industry." In April 2016, WMAA launched WMAA Career Centre, a new employment site that connects waste and resource recovery professionals across disciplines and career stages with employers offering career opportunities. The WMAA Career Centre is powered by YourMembership, the leading provider of job websites and career centres for organisations that serve niche audiences. "Providing our members with opportunities for professional development and career growth are core to our mission in serving waste and resource recovery professionals," said Martin Tolar, WMAA Chief Executive Officer. "Our members are highly attractive to employers because they have demonstrated a commitment to the highest levels of professionalism and innovation," he continued. "YourMembership's technology and sales support will ensure that our website serves our members by providing a clear view into organisations that value and seek the skills, expertise, qualification and training they have to offer." "The WMAA submission to the NSW Container Deposit Scheme (CDS) Discussion Paper recognises the political reality surrounding the CDS, and seeks further analysis of the impact of any scheme on the well regarded kerbside system in NSW", said Martin Tolar, Waste Management Association of Australia (WMAA) Chief Executive. "We understand that the government has given a commitment to introduce a CDS and that there is broad community support for the policy. Our view, however, is that it is essential that safeguards that protect the significant industry investment that has been made to deliver an effective kerbside recycling program are established. Now is not the time to rush like a bull at a gate and take a scatter gun approach to this important community issue. Rather, WMAA will be taking a considered approach to ensure the Baird Government can achieve its policy objectives, while also ensuring the interests of the state's waste and recycling industry are also protected. We look forward to further consultation with the NSW EPA on this matter." To view the WMAA Submission to the CDS Discussion Paper, click here.